Therefore the solid body of the earth is reasonably considered as being the largest relative to those moving against it and as remaining unmoved in any direction by the force of the very small weights, and as it were absorbing their fall. And if it had some one common movement, the same as that of the other weights, it would clearly leave them all behind because of its much greater magnitude. And the animals and other weights would be left hanging in the air, and the earth would very quickly fallout of the heavens. Merely to conceive such things makes them appear ridiculous. Footnote: Carlyle says, in his History of Frederick the Great, book ii. chap. vii. that this saying of Alphonso about Ptolemy's astronomy, 'that it seemed a crank machine; that it was pity the Creator had not taken advice,' is still remembered by mankind, — this and no other of his many sayings. In John Bartlett and Nathan Haskell Dole (Ed. ), Familiar Quotations: A Collection of Passages, Phrases, and Proverbs Traced to Their Sources (1914), 954. Because a fact seems strange to you, you conclude that it is not one. ... All science, however, commences by being strange. Science is successive. It goes from one wonder to another. It mounts by a ladder. The science of to-day would seem extravagant to the science of a former time. 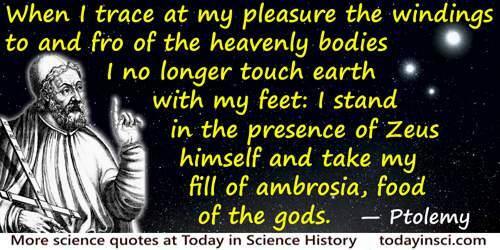 Ptolemy would believe Newton mad. In Victor Hugo and Lorenzo O'Rourke (trans.) Victor Hugo's Intellectual Autobiography: (Postscriptum de ma vie) (1907), 322. It’s only through honesty and courage that science can work at all. The Ptolemaic understanding of the solar system was undermined and corrected by the constant pressure of more and more honest reporting. In essay, 'The Origin of the Universe,' 6. Written after hearing Stephen Hawking's lecture (2006) at Oxford, about the origin of the universe. 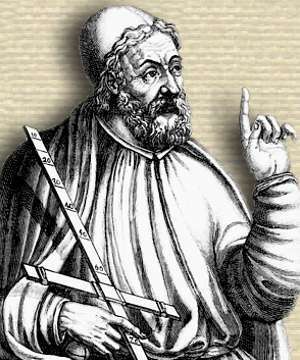 They say that Ptolemy once asked him [Euclid] whether there was in geometry no shorter way than that of the elements and he replied, “There is no royal road to geometry”. In (Edition Friedlein, 1873), Prol. II, 39.